Composition: 5 ml solution (1 ampoule) contains 5 mg Chelidonii radix special liquid extract in 5 ml bi-distilled water for injection, with a pH range of 3.5-5.5. 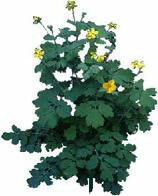 UKRAIN is a derivative of alkaloids from the greater celandine plant. Numerous scientific tests have demonstrated that the preparations destroys cancer cells through apoptosis (programmed cell death) without attacking healthy cells. The drug is easy to use and the therapeutic dose has no significant side effects. The anti-tumour effect of UKRAIN is the result of the interplay between the properties of several compounds. In contrast to traditional chemotherapy, the inhibition of cell division by UKRAIN is confined to tumour cells, while the cells of healthy tissue remain unaffected. Excellent tolerance to UKRAIN therapy results there from. UKRAIN modulates the human immune system so that the body's own resources start to combat the tumour. UKRAIN also inhibits the formation of new blood vessels through which the tumour is supplied with nutrients and through which single tumour cells can migrate to other parts of the organism. This leads to "starvation" of the tumour and inhibition of the formation of metastases. On account of its anti-angiogenic properties, the pre-operative administration of UKRAIN leads to tumour encapsulation and therefore significantly improves operability. Post-operative application of UKRAIN greatly inhibits the formation of metastases. Chelidonium majus L. (Greater celandine) first was mentioned as a medicinal herb in EBERS PAPYRUS (written 3,500 years ago). The anti-tumour properties of the plant extract were described in a medicinal herb book published in 1536.